The autonomic nervous system (ANS) is a complex set of neurons that mediate internal homeostasis without conscious intervention or voluntary control. Cells of the ANS innervate all viscera and influence their activity locally as well as mediate global changes to the metabolic state of the organism. The ANS maintains blood pressure, regulates the rate of breathing, influences digestion, urination, and modulates sexual arousal. The autonomic nervous system can be contrasted to the somatic nervous system, which is controlled voluntarily. Where the autonomic nervous system controls things like heart rate and digestion, the somatic nervous system controls things like muscle movements. Breathing is a function which can switch between the autonomic and somatic nervous systems; this is why you are able to hold your breath, but also why you never have to think about breathing. The autonomic nervous system controls many systems, including the cardiovascular system. It can alter the force and rate of heart contractility, as well as the constriction and dilation of blood vessels. Therefore, it also influences blood pressure. The rate of breathing can also be changed by the autonomic nervous system. It affects both skeletal and smooth muscle fibers across the body, whether it is changing the metabolism of glucose in skeletal muscles or causing pupil dilation in the eye. The autonomic nervous system can influence digestive efficiency, altering the secretion of enzymes from glands and the rate of peristaltic movement. For instance, activation of the sympathetic nervous system slows down digestion and diverts blood flow towards skeletal muscle. It can impair sexual arousal and shut down most non-essential functions of the body. On the other hand, the autonomic nervous system can also enhance digestive secretions, peristaltic movements, encourage normal cycles of circadian activity, encourage deep sleep, and activate the repair mechanisms of the body. Involuntary actions like sneezing, swallowing or vomiting are also controlled by the ANS. There is evidence that the autonomic nervous system not only influences sexual arousal but also plays a crucial role in maintaining pregnancy and inducing labor. Finally, the autonomic nervous system also changes urinary output and frequency of micturition. There are two major divisions of the autonomic nervous system. The first is the sympathetic nervous system. The sympathetic nervous system generally controls the “flight-or-fight” response. This includes releasing stress hormones, regulating the metabolism of cells, and generally maintaining homeostasis in an organism. The second division of the autonomic nervous system is the parasympathetic nervous system. This division generally controls the “feed-or-breed” responses, including food gathering behaviors, mating rituals, and sexual activity. In most cases, a physiological response by the parasympathetic nervous system is in direct opposition to the results mediated by the sympathetic nervous system. The autonomic nervous system contains two types of neurons that interact with each other at ganglia near the spinal cord. The initial preganglionic neurons begin at the central nervous system in different parts of the spinal cord. These preganglionic neurons form synapses with postganglionic neurons at ganglia that decorate either side of the spinal cord. The postganglionic neuron forms a synapse with effector cells. 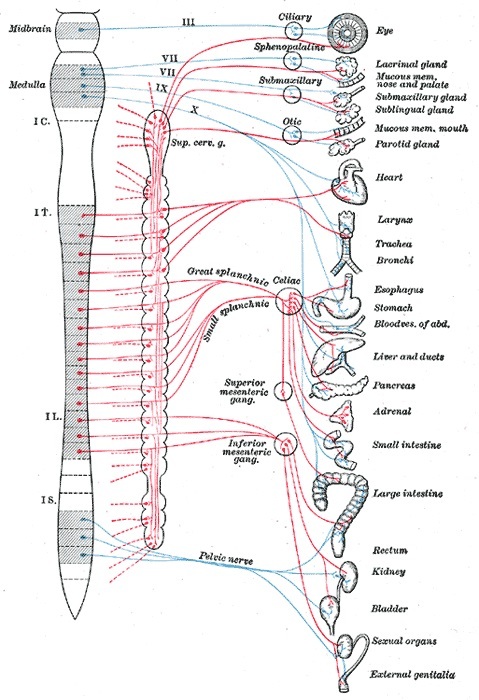 The neurons of the sympathetic nervous system emerge from the thoracic and lumbar regions of the spinal cord, while the parasympathetic neurons are associated with the cranial and sacral regions. The sympathetic nervous system is usually activated in response to emergencies, especially those that threaten survival. On the other hand, the parasympathetic response is related to enhancing growth and reproduction. The autonomic nervous system is often described using the response to imminent physical danger and the recovery of the body after the threat has receded. For instance, when faced with a predator, the body increases heart rate and breathing, reduces digestive secretions and activity, and preferentially diverts blood towards skeletal muscles to enable the body to physically combat the challenge. This is usually accompanied by piloerection to conserve body heat. This is why the sympathetic nervous system is said to mediate the fight-or-flight response. Once the situation has become calmer, the parasympathetic nervous system restores the body towards normal functioning, resuming digestion and excretion, reducing blood pressure and restoring normal circadian rhythms. However, even in the absence of an external threat, the two branches of the autonomic nervous system undergo changes and interact closely with the endocrine system to minutely monitor the internal and external environment. For instance, sympathetic activation can lead to an increase in circulating plasma levels of epinephrine and norepinephrine secreted from the adrenal gland. Usually, heart rate increases during inspiration and decreases during expiration. This variation is normal and is influenced by the vagus nerve, and thus the autonomic nervous system. When heart rate variability decreases, it indicates reduced parasympathetic activity. Hormones can alter the autonomic nervous system response as well. In fertile, reproducing mammalian females this interaction between the ANS and the endocrine systems is particularly interesting. Estrogen is involved in increasing the activity of a crucial part of the parasympathetic nervous system – the vagus nerve. Estrogen simultaneously dampens sympathetic nervous system activity. The hormone progesterone appears to have the opposite effect. In the follicular phase of the menstrual cycle, there is increased estrogen concentration within the bloodstream. Under the influence of increased plasma estrogen concentrations, there is an increase in parasympathetic nervous activity, which causes an increase in heart rate variability. On the other hand, during the luteal phase of the menstrual cycle, heart rate variability points towards a decrease in vagal activity. This suggests another shift in the sympathovagal balance. The importance of these changes to the cardiovascular microenvironment is not fully understood, but it is hypothesized that this could explain the differences in the risk faced by men and women for heart disease. However, it is important to note that gross cardiovascular parameters such as blood pressure or heart rate remain mostly unaffected by the phase of the menstrual cycle due to other compensatory mechanisms. The interaction between the autonomic nervous system and the cardiovascular system becomes even more important during pregnancy as there are large-scale changes to hemodynamics. Blood volume, basal oxygen consumption, red cell mass, cardiac output, and the heart rate increase in pregnant women. Both systolic and diastolic blood pressure drop and there is extensive remodeling of all blood vessels. While the changing hormonal environment primarily mediates these changes, the autonomic nervous system is also an important player. Again, heart rate variability becomes a relatively sensitive and non-invasive measure of autonomic nervous system activity. Studying the variability in heart rate of pregnant women at different gestational ages shows an increase in vagal activity in the first trimester, coupled with a decrease in sympathetic nervous system activation. This reverses as gestational age increases, with great spikes in neural activity of the sympathetic nervous system and the release of adrenal hormones as the woman nears term. 1. Which of these statements about the autonomic nervous system is true? C. Interacts with the endocrine system. 2. Which of these statements about the vagus nerve is true? C. Increased activity during the third trimester of pregnancy. 3. A group of surgeons is working hard on a liver transplant. The procedure lasts for over 12 hours during which time they were mostly standing, focusing deeply, and looking intently at the surgical surfaces. If it was possible to measure their physiological parameters, which of these changes would be seen in their bodies? 4. Which of the following is NOT a function of the autonomic nervous system? A. Your pupils dilate in response to the light level of a room. B. You want to reach a can of beans on the top shelf, so you raise your arm above your head. C. Your breathing rate increases as the stress hormone cortisol is applied to your system. 5. What is the major difference between the autonomic nervous system and the somatic nervous system? B. Somatic is mainly voluntary and reflexive, whereas the autonomic nervous system controls sub-conscience actions. C. The somatic system controls sub-conscience actions, whereas the autonomic system controls voluntary actions.